I have been reading Xiaolu's gorgeous blog, 6 Bittersweets, for a while now. Her beautiful styling and thoughtful recipes are always mesmerising. And, she is a student! How she finds time to do so much and balance a hectic student's life, I have no idea but I admire her even more for it! Just as starting a food blog 2 years ago introduced me to friends around the globe, joining Twitter this year has enriched my life with even more incredibly talented, caring, and equally food-obsessed pals. Asha was one of the first among these new friends. Early on she reached out to me, impressing me with her warm and cheerful spirit, exciting recipes, and wonderful photography. When she then invited me to contribute to the celebration of her 3-year blog anniversary, of course I said yes right away! Although the theme was Street Food, Asha was even kind enough to let me share a Chinese dessert that is traditionally a soup, but which I made more "street-savvy" by borrowing an idea from our Japanese neighbors. Thank you for the warm reception, Asha and all of you! Cheers to 3 wonderful years of Fork Spoon Knife and many many more to come! When Asha asked that I share a dessert reflecting my Chinese heritage, I immediately knew what I wanted to make: black sesame tang yuan, or sweet rice dumplings. Tang yuan (literally meaning "soup [with] round balls" is a treat that has great significance in Chinese culture as well as to me personally. These dumplings are traditionally served during the winter solstice celebration, Chinese New Year, and even weddings. Usually eaten with one's family, the round shape of these dumplings are supposed to symbolize unity and harmony. As for me, I find tang yuan not only fun to eat but also love the rush of childhood memories that come with each chewy bite. Tang yuan traditionally consists of filled or unfilled chewy sticky rice balls (similar to mochi) that are served in a sweet soup. Common fillings include sweet peanut paste, red bean paste, Chinese rock sugar, and black sesame paste. Diversity also exists among the sweet liquids in which the dumplings are served. These range from red bean soup to ginger syrup, black sesame porridge to sweet rice wine egg drop soup. With so many options to pick from, and that's not even counting new flavors you could make up, tang yuan never gets boring! To add yet another option to the list, I've taken the yuan ("round balls") out of the tang "soup." 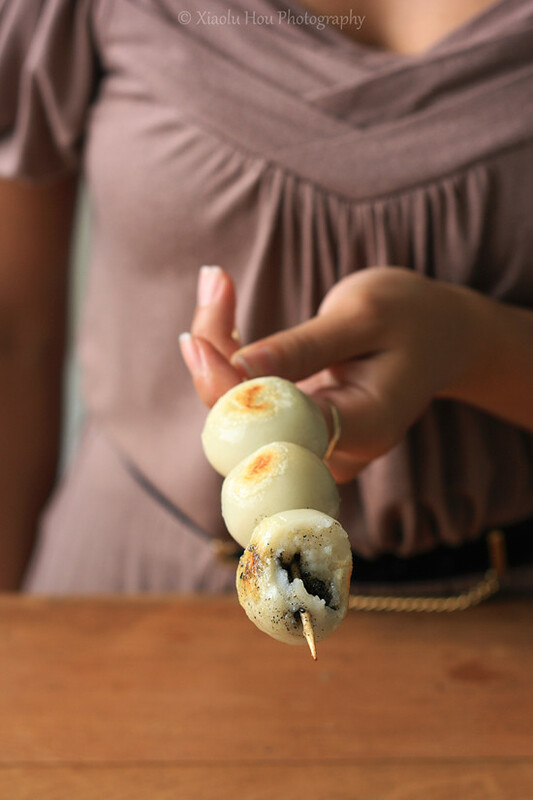 Inspired by the Japanese street food, dango, I've put my favorite black sesame-filled tang yuan on skewers, grilled them, and glazed them in a fragrant ginger pandan osmanthus flower syrup. After all, isn't everything more fun to eat on a stick? Whether you prefer the soup or skewer option (I've included directions for both), I promise you're in for a real treat! 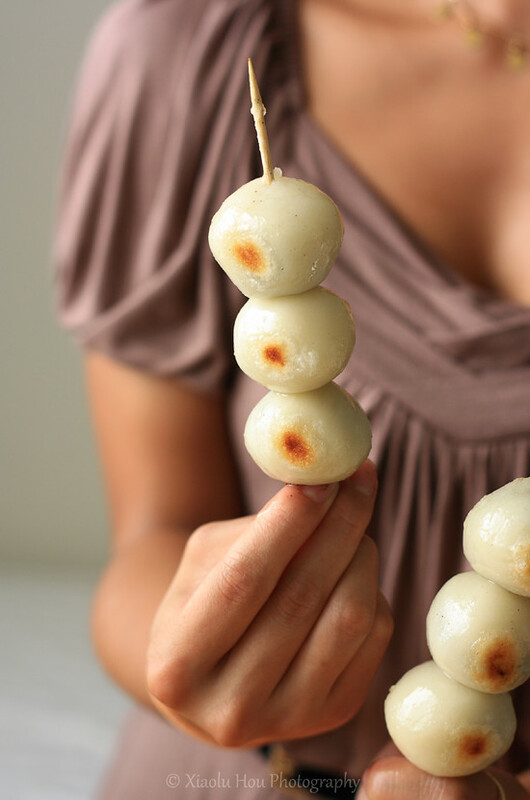 XIAOLU'S NOTES: If not making Dango-style skewers, you should just use 12 oz. sticky rice flour and no plain rice flour, as is traditional for the Chinese dumplings. Osmanthus flowers can be found in Asian stores and fine tea shops. Don't overfill the dumplings or they will likely break open when cooking. The ginger syrup is optional if making the Chinese-style dumpling soup. If you don't want to make the syrup, simply serve the dumplings with a little of the water they are boiled in. Lightly toast the black sesame seeds over medium fire until you smell the aroma of the black sesame seeds. Please take note that the sesame seeds will start popping when they are heated, so use your lid to cover. Don’t burn the black sesame seeds; transfer them out and let cool as soon as they smell aromatic. In a big bowl, mix the rice flours with water until it forms a smooth paste and no longer sticks to your hands. Divide it equally into 24 to 30 balls (depends how you like the size, the bigger the size, the easier it is to do the filling). Flatten each ball in your palm, and then use a pair of chopsticks to pick up some black sesame paste and lay it in the middle of the flatten ball. Fold the edge to seal the dumpling. Lightly roll it into a ball shape using both palms, very gently and delicately. Set aside. [See this video for a visual of the wrapping process]. Prepare the ginger syrup by boiling the water. Add the ginger and screwpine/pandan leaves (optional) into the water and boil for 10-15 minutes with medium heat. Add sugar and sweet osmanthus and boil for another 5 minutes. Lower heat to simmer and reduce to about 4 cups of water. [Reduce to about 1 cup of syrup if making skewers.] Add more sugar to taste if you like. Strain syrup through a sieve to remove the ginger and pandan. Keep warm until needed. Heat up another pot of boiling water. Drop the dumplings into the hot boiling water. As soon as they float to the top, use a slotted spoon to remove them to a bowl. 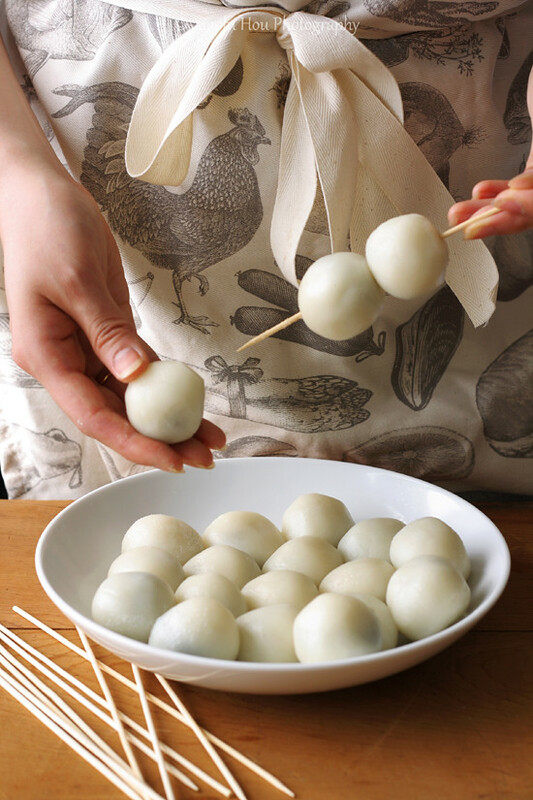 If serving these in the Japanese style on skewers, cool the dumplings and then put them into the wooden skewers. (3-4 dumplings each stick.) Grill the skewered dumplings on a grill or a grill pan [I just used a frying pan], turning several times, until nice burn marks form over them. Place skewers on a wide plate and pour ginger syrup over them while still warm. Enjoy right away or at room temperature.